But a field trip to the zoo changed my life. My teacher announced EVERYONE had to wear jeans. No dresses were allowed. I freaked out. What was I? Some type of peasant?! 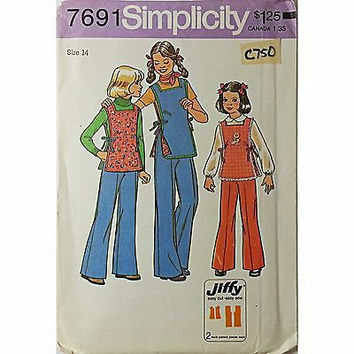 Luckily, my mom, who was skilled in the polyester arts, whipped up an orange pastel pantsuit with a matching top so I could roam through the zoo without looking like a female hobo. I was HOOKED! I climbed without boys looking up my dress, I ran without a skirt getting tangled around my legs—it was freedom! My love for pants evolved. In seventh grade I developed a rabid devotion to Levi’s Button-fly 501 jeans. In high school, the dance company members wore loose, comfy sweat pants so people could see we were cool enough to wear sweat pants to school. When I was pregnant, my relationship with pants changed again. As my belly grew, I wore regular jeans, threading a shoelace through the button hole and tying it around the rivet of my jeans. Worried that my child would be born with the Levi’s logo on her forehead, I decided it was time for maternity “jeans”. Maternity pants back in the day, were nothing like today’s stylish maternity wear. It was all horrible colors (Lavender? Really?) with horrible fabrics and that horrible front elastic panel that never quite fit and kept sliding under my quickly-expanding belly, making my pants sag like they were filled with coal. After giving birth, I was so excited to wear regular jeans again that I packed a pair to wear home from the hospital. I had no idea my body wouldn’t bounce back to its pre-stretched-out position. I spent nearly 45 minutes in the hospital bathroom, trying to push my belly flab into a location where I could button up my jeans. I almost passed out twice. I fell over once. Finally, I pushed my belly up to my bra and hurriedly buttoned my jeans. I couldn’t breathe or walk and when I got home my belly literally exploded out of my pants, sending denim flying in all directions. I wore pajamas for six months before trying to wear pants again. Jeans pair with anything and it doesn’t matter if they’re boot cut, boyfriend, skinny or cropped; jeans are my go-to attire—because I’m a princess, dammit! Hilarious and yes, jeans are my main attire also.